The 2D EXchange SpectroscopY (EXSY) technique is exactly the same as the same as the 2D NOESY technique. The pulse sequences are identical. The method provides off-diagonal responses for spins which exchange slowly with one another (either conformationally or chemically) and also between spins with NOE's. The EXSY method is useful for showing exchange when the rate of the exchange is greater than or of the same order as the T1 relaxation rate (1/T1) but less than the frequency difference between the two spins (in the absence of exchange). Depending on the experimental conditions, the responses due to exchange are often much more intense than those due to NOE's. 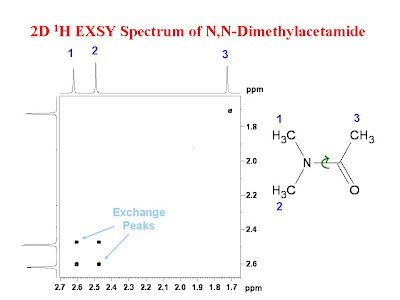 The figure below shows the 300 MHz 2D 1H EXSY spectrum of N,N-dimethylacetamide at room temperature. At this temperature, the molecule exhibits slow rotation about the (CH3)2N - C bond such that both methyl groups exchange with one another rotationally yet are distinct in the spectrum. This is evident by the cross peaks in the spectrum between the two methyl groups on the nitrogen. Note that the off diagonal peaks are of the same phase as the diagonal peaks. Firstly congratulations for your very usuful and great blog. Regarding Exsy-2d experiments you said that sequence is identical to NOESy-2d. There is a kind of filter for eliminate NOE peaks? Thank you for your question. AS far as I know there is no "filter" to discrimminate between NOE's and exchange peaks. This is not usually too much of a problem for small molecules as the exchange peaks are much stronger than the NOE peaks and of opposite phase. Would I be correct then in saying that it is possible to see both positive and negative signals (opposite phase and in-phase wrt diagonal) for the same proton signals arising from NOE contacts and simultaneous slow conformational exchange? I have such a spectrum on my desk at the moment - the first example I've seen of this behaviour but it seems to be the only explanation. 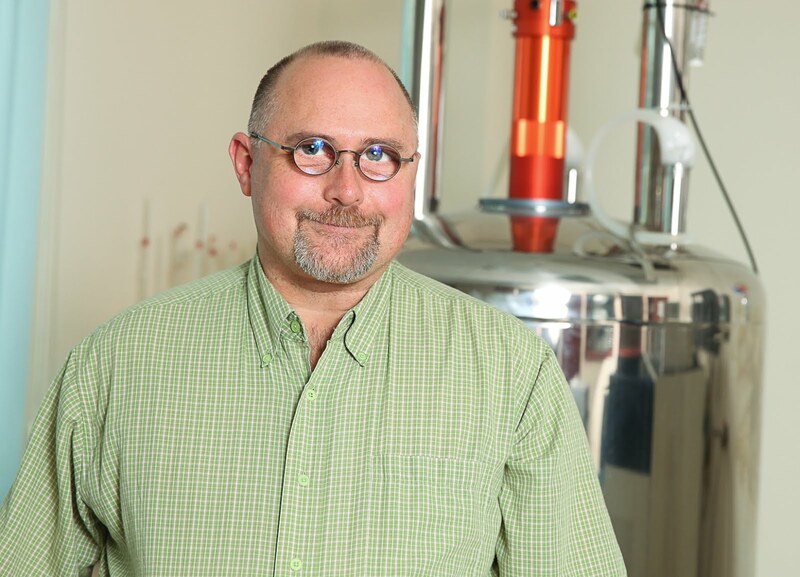 PS for Ricardo - there's supposed to be something called CLEAN-EXSY - here's a snippet from the Bruker documentation "Modified EXSY pulse sequences have been proposed to remove NOE effects (CLEAN-EXSY experiment) and to study protein hydration (89JACS1871)". Also thanks for the info CLEAN-EXSY.